Suspension pending prosecution- where charge is 1192 (2) (3) (4) and same conduct gives rise to charge of vehicular assault, or manslaughter PL 120, 125 or if there is a prior 1192 conviction in the past five years. Revocation upon refusal to submit- hearing required within 15 days of arraignment 1192-2 (2)(c). Finding of refusal results in minimum 1 year revocation 1194-2 (2)(2)(d). These are court imposed revocations. If 3 or more convictions within 10 years, DMV extends waiting period for re-licensure 6 months for each alcohol related incident. Motorist under 21 of age or operators with a commercial license may face greater periods of revocation. Where BAC is .08 or more: 30 days or until disposition of case whichever is more. 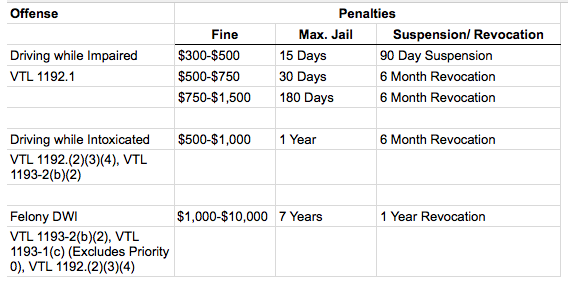 Motorist can apply for Hardship Privilege license, and pre-conviction conditional license after thirty days.